I guess it was about three to four years ago when Michael was hit by a police car while riding his Yamaha cruiser. I don’t what to discuss the details of the accident since it is still in litigation and the court case is on going. However it is suffice to say that it left him at the side of the road with a completely smashed left leg and some other major scratches and bruises. The rebuilding of his leg is an ongoing process and in fact he just had a last operation that replaced metal, shaved bones and included all that gory stuff that I do not even like to imagine or visualize. I had picked him up from the hospital on November 6th, 2014 and yesterday he picked me up in his car and we spent the day shopping at outdoor camping equipment stores for needed “stuff” for his planned adventure to Alaska and then the Panama. He had no pain killers and seemed to be walking fine. The BIG BANG three years ago left Michael on major pain medication and bed ridden for some time. However the first thing he did when he was able to crawl out of his bed was to exam the condition of his Yamaha and begin the planned restoration of it. He started ordering parts from around the world since his bike was a classic survivor from the eighties. I believe it was a Virago. When he went from crawling to walking he actually focused his recovery time on rebuilding the Yamaha. I guess he had in the back of his mind the old saying “When you fall off a horse you have to get right back on“. Two years ago I went riding with Michael for the first time since we have only being friends since the last three years when he was recommended to me as a potential dog sitter since he was not yet back to work and loved dogs. At that time I had a Vespa 300 GTV yet he never turned up his nose to ride with me like many other Harley riders would have. After getting to know Michael, I was amazed at how he was able to get back on the bike. But more over, he would do work for me in the back yard such as rebuilding a fence. Fence building is hard work for most of us not to mention a person recovering from multiple surgeries to rebuild his leg. He never complained about the pain, but it was clear that his limping would increase incrementally with each fence post or board he would pick-up and carry. By the end of the day he would go home, bath, take pain killers and sit still on his lazy boy until the morning. I would never even dream of building a fence in the middle of such a recovery to my leg. But that is Michael Fritz! He suffers through the pain, endures it and rides on. With that brief history, I think you can imagine how Michael will endure throughout his future adventures on his bike. 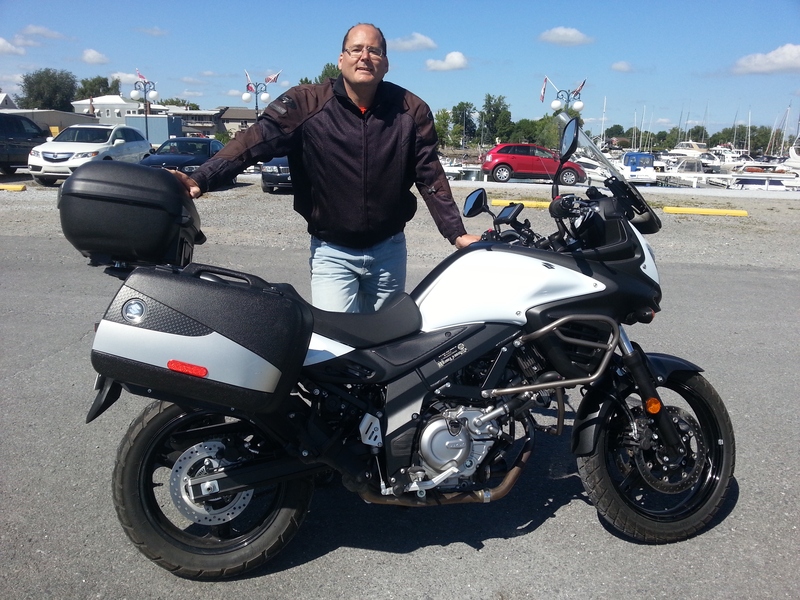 He has since sold the Yamaha and purchased a Suzuki V-Strom 650 Off and on road motorcycle. He purchased it this past summer and ever since he started dreaming about a long ride. Since a “long Ride’ is such a relative term and to some it may mean riding up to the cottage on a weekend and to others it could mean riding to Disneyland. But that’s not what a long ride means to Michael. I think that after his surgeries, suffering and endurance that it was necessary for Michael to push himself towards each painful recovery step. I think that this has become part of his life. So for you and I and most people, a long ride means pushing ourselves that extra mile when our back begins to get sore. Let me explain clearly Michael’s definition of a “Long Ride”. It means packing the motorcycle in such a way that he will be self-sufficient to camp and eat anywhere such as very cold or very hot temperatures, defend himself from wild life such as bears, and be able to keep up his motorcycle when it fails him or simply tips over when crossing a river. Yes, all of this plus is required when you plan to ride from Cornwall, Ontario Canada to Alaska, USA and then down south to the Panama. Michael is not yet fifty but I know he is over 40. I believe that this trip is necessary as the last step towards his full recovery. More importantly however is that I believe he strongly desires a life changing adventure. I do not think that he will return, at least not for a very long time. In his past life he worked for charity and organizations that provided help in third world countries many in the middle of a war. I think he is drawn back to his wish to dedicate his life to helping others. I think that one day in the near future that I may take a Plane (not riding a motorcycle) to a small village on the outskirts of the Amazon to visit Michael and see the work that he does to help the people. Michael has decided to combine his needed adventure with raising money for cancer research in Canada and the United States. Therefore his journey will not only be about his suffering and endurance in wilderness areas along his path but also about relieving the suffering of others. Everyone can now take part in his journey and help raise money for cancer research. We can follow Michael from the time he leaves Cornwall until he settles somewhere in South America. We can plan to meet him somewhere along his journey and even offer him a meal, shower or bath since I know it would be much appreciated. I wish Michael great luck throughout his journey and I will be one of his many supporters. I just thought that this post is necessary so that everyone can understand Michael. He would never write such a thing about himself. I helped him set up this blog in preparation for his trip so I had administration rights to publish this. I am certain that he won’t mind. He may feel a bit embarrassed or shy which is just the kind of guy he is. “It’s all about the ride ’bout the ride, no trouble. All about the ride, ’bout the ride, no trouble” Not sure Meghan Trainor would go for my lyrics, but they do in some ways sum me up. I love the ride. No matter where, when or even what I am riding. Though I certainly do have my favourites. I suppose my love began when I was about 5 years old and my father bought my brother and I a little blue battery operated motorcycle. I spent countless hours on the little blue machine, probably driving my folks batty. Then around 8 or 9 my friend got his first dirt bike and he allowed me to take it out. I think from that point on I was lost in the motorcycle world. 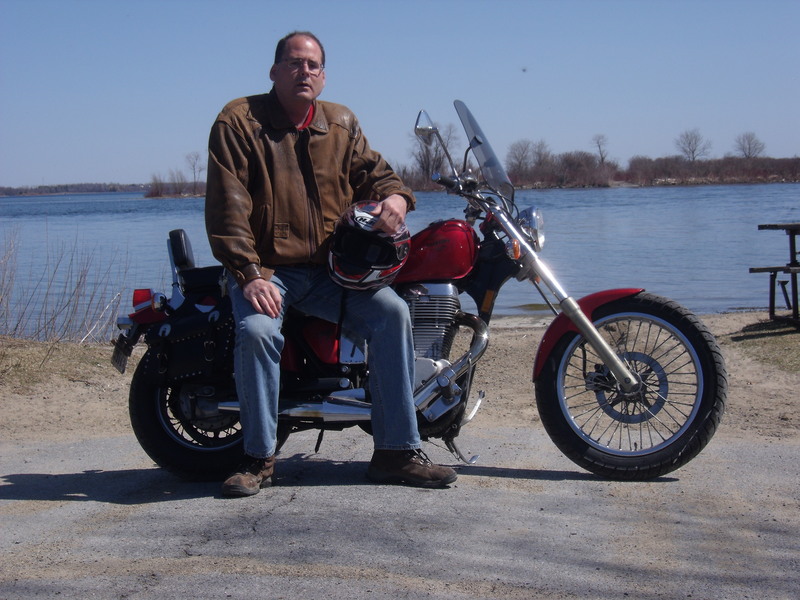 At age 16, to my mother despair, which by the way still lingers to this day, I went and got my motorcycle learners permit on my birthday which falls middle of winter. But I was hell bent on being the first one to book my riding test the day the testing facility opened for motorcycles. That spring day came and went. I still recall it like it was yesterday. All those pillions, the stops signs the corners and the instructor yelling out commands to me. I was a nervous wreck but I made it and I was on the road!!!. Throughout the years I’ve almost always had a motorcycle. However, at one point I did trade in my motorcycle for a back pack and headed through North, South, and Central America with just what I was wearing on my back. It wasn’t long before I bought a new motorcycle. Never loosing that passion for the ride. 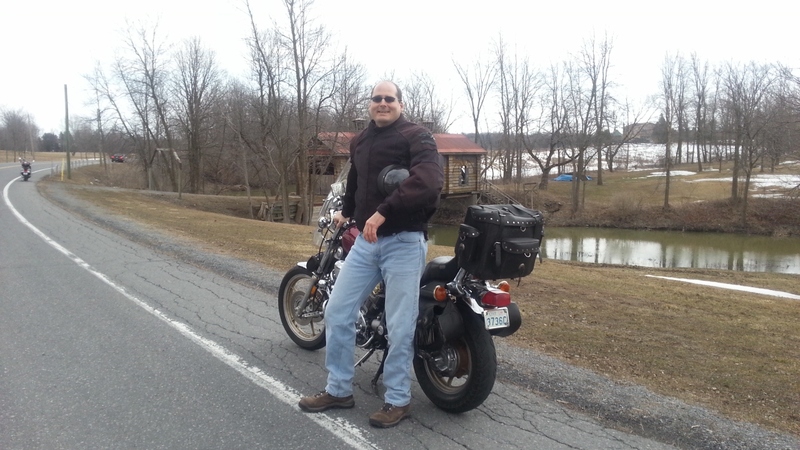 In fact those several years without a motorcycle caused me to want that freedom of the ride even more. So when I got back into it riding it seemed to have increased 10 fold. I can recall my first bike I bought myself after getting back into riding. A little Suzuki, Savage. Now in there lays a “beast of a bike”. Imagine a 6’3″, 230 lb man riding this.. Well, I sort to dwarfed it, and in spite of chewing on my knee caps as rode I was at least back on the road. However, it wasn’t long before I upgraded again and again and again. 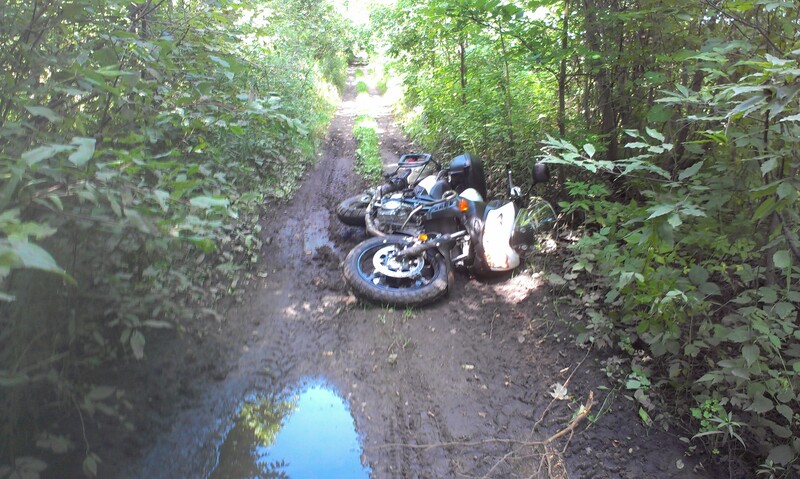 Several years ago I was involved in a fairly serious accident on my motorcycle. This wasn’t my first one. At age 17 my motorcycle was literally run over by a transport and it’s trailer, leaving me a somewhat thinner version of my original bike.I walked away from that with a sore knee. Then over the years I few other minor accidents involving me and the tarmac, but always got up, brushed myself off and then went on to determine the damage on my bike. I’ve always sort of had this bit of a ” super-man” complex. Never really having met my ” krytonite”, Closest I had come to that at that point in my life was a daunting ex. This accident, however, left me with some pretty serious leg damage. I was fortunate to have one of the best Orthopaedic Surgeons in Ontario do a remarkable job or reconstructing my leg. However, after that for a short , very short, very very very short period of time I believed that I had met my krytonite and that this was the end of my superman days and that in the best interest of all humanity I should give up biking. ……………… Off course that did not last for long. I think the first day, out of bed, on my crutches I made my way outside and saw my motorcycle which I had bought back from the insurance company. At that moment I decided with all the determination I had it would be ridden again. Almost 9 months to the day after my accident I was out riding again. Since then I have gone through 3 other surgeries to continue to repair/reconstruct my leg. All surgeries I have requested of my Dr’s to book during the fall winter season so I would not miss the nice riding month. I’ve recently just had my fourth of five surgeries. This last summer I combined a sort of passion of both the off road experience from my youth and the on road touring ride by buying myself a 2014 Suzuki V-Strom. I was soon touring down the roads on this incredible machine and finding the most rugged off road tracks I could and that I though I could handle. And sometimes it turned into a little more than I could handle As I was told by a few other V Strom riders, it is not a matter of ” if” you will lay it down it is really a matter or when you will lay it down. Those off roads trails and the new adventure of owning a bike that would take me places most road bikes never would or could go re kindled an old passion, first to drive to Alaska. I tossed that Alaska idea around for a few weeks then the dream began to blossom. I figured if I was going to go to Alaska then why not to British Columbia and visit an awesome friend. Hey, after all it is only a few thousand more km’s, Then I realized wow my brother and his family live in California so what is a few thousand km’s between family. Then rolled in the old dream of driving a motorcycle all the way into South America. If I was going to commit to this adventure then why not throw it all in at once. So began the journey of driving from my home in Cornwall to Alaska then down to Panama then jumping into South America and ending up in Tierra Del Fuego. In those months of riding I will be trying to set a bit of a schedule for myself, To meet up with friends, family and other riders who would like to join in. As well, I want to ride for a reason. There is nothing like a ” little ride” but nothing more full fulling than riding for a reason. I will be raising funds for both the American and Canadian Cancer Societies. I will be stopping along the way to meet up with other groups, stores and individuals for rides and meet up. All to bring awareness and funds to the fight against cancer. I know that in some way all of us have been affected by this illness. I’m not focusing on the problem but the solution. There is a cure, it will just take more time and money. I’m hoping in my small way I can, with your help, bring a little more to the table. Once I reach Panama my trip will take a a slower pace as I continue to make my way down to Tierra Del Fuego , I will be stopping for some time in Columbia, volunteering where and when I can. I will slowly make my way further south but at much less scheduled pace. I will be making more ” lay over” stops spending more time experiencing the people and cultures, taking some very interesting rides, like on Bolivian Salt Flats, and perhaps the ” Road of Death”. So come alone. If you are along my path why not join me for a day or two ride. My itinerary will be posted over the next few months as I get closer to the day of departure, which will be June of 2015. Please always feel free to make a comment. Nothing like logging on and see a new comment from a friend, family or total stranger..
Life is never about the problems. It is always about the solution. My friend Pedro road from Redmond, Washington to Rio. Check out his facebook page, “Redmond to Rio”. He might have some good advice or knowledge. My wife was reading about you on facebook. We (Heinz & Felicitas) live in Fingal Ontario and we are doing about the same trip this year from May 2015 – April 2016. So I am sure we will meet along the way. Maybe we should exchange some ideas and tips. Our blog is not up yet. Wow that is so exciting. Heinz. I just arrived home from meeting someone who lives in Kingston Ontario who did the trip in 2013-2014. What a world of wisdom and knowledge this guy had. I would love to share and compare notes with you guys. After meeting this guy today for 9 hours gave me more insight into the real journey, not only the roads and conditions and cultures about the inner journey a trip like this gives us all. Please by all means add me as a friend on Facebook.